Blood Pressure Charts | What Does My Blood Pressure Reading Mean? Look up your current blood pressure reading for guidance on what it could mean. NOTE: This information isn't a substitute for medical advice provided by your own doctor. If you think you might have hypertension or elevated blood pressure, be sure to discuss your blood pressure concerns with a doctor or nurse, who can help you factor in other important information, such as other medical problems you may have. In particular, the information below and in the related links may not always apply to those who are very old, very frail, or have multiple chronic medical conditions. Also, if you find that your systolic blood pressure (the first, or "top" number) is higher than at least 130, and your diastolic number (the second number, or "bottom" number) is lower than 80, you may have something called Isolated Systolic Hypertension. This type of high blood pressure becomes more and more common as people get older. For this kind of hypertension, doctors usually conclude it's more important to focus on the systolic pressure, rather than the diastolic pressure. Readings above 180 systolic pressure (the upper number) or above 110 diastolic pressure (the lower number) usually indicate a hypertensive crisis -- putting you in the highest risk category for heart attack, stroke, and other acute life-threatening problems -- and requiring emergency care. Very high blood pressure can cause symptoms such as headache, nausea and vomiting, mental confusion, vision changes, chest pain, or shortness of breath. If you notice any of these symptoms along with a blood pressure above 180/110, your high blood pressure is considered a hypertensive emergency; call 911. To learn more about what your blood pressure reading means and what you can do, click on the link, below, that most closely matches your reading: "
Systolic blood pressure readings at least 140 or diastolic blood pressure readings at least 90 usually indicate STAGE 2 HYPERTENSION, which puts you at high risk for life-threatening problems such as heart attack and stroke. Systolic blood pressure readings between 130 and 139 or diastolic blood pressure readings between 80 and 89 usually indicate STAGE 1 HYPERTENSION, which means the force of the blood pressure in your arteries is higher than normal, putting you at increased risk of life-threatening problems such as heart attacks and stroke. Blood pressure in this range can also damage organs such as the heart and the kidneys over time, especially in people who already have chronic medical problems affecting these parts of the body. If you're already being treated for hypertension with medications, and your blood pressure is in this range, you may need to have your medications adjusted. If you've never been diagnosed with high blood pressure before, you may have developed hypertension. 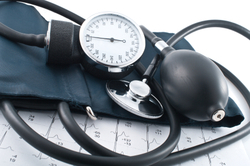 Hypertension is defined as a systolic blood pressure at least 130, and/or a diastolic blood pressure at least 80. For a new diagnosis hypertension should be confirmed on at least 2 office visits after an initial screening. Systolic blood pressure readings between 120 and 129 with diastolic blood pressure readings less than 80 usually indicate ELEVATED BLOOD PRESSURE, indicating you don't have hypertension but your blood pressure is higher than what experts consider optimal for most adults. Research studies suggest that people with elevated blood pressure are more likely to have a heart attack or stroke, compared to people with lower blood pressure. However, many experts currently don't recommend using medications to treat elevated blood pressure, unless the patient also has other medical conditions that would benefit from lower blood pressure (such as heart failure or kidney disease). Many people with elevated blood pressure eventually develop true hypertension, so having your blood pressure checked regularly is important. If you're already on medications for high blood pressure, this level of blood pressure is often considered adequate control by most doctors. Readings above 90/60 and below 120/80 indicate that the pressure in your arteries is considered normal for most adults. However, in some cases, a systolic blood pressure below 110 can be associated with dizziness when standing. This is more likely to happen to older adults or to people who usually have a much higher blood pressure. Readings at or below 90/60 usually indicate an abnormally low blood pressure, or what's called HYPOTENSION, meaning the pressure in your arteries is at the lower end of what's considered normal. Some people with blood pressure this low may be prone to weakness or fainting, but many people feel just fine. If you're taking blood pressure medicines, they're probably lowering your blood pressure more than they need to, and they should be adjusted. It's also possible to get low blood pressure as a side effect of certain medications. If you're not on any blood pressure medicines, there's usually no need to be concerned about low blood pressure unless you're experiencing symptoms such as dizziness, fainting, nausea, or fatigue. In fact, hypotension isn't usually diagnosed unless the patient is experiencing symptoms.